At the Brighton Festival a pyramid-shaped inflatable with a transparent outer skin and yellow inner skin, partially inflated cushion as kinetic floor, was set up by the seaside. The visitors could enter and play on its soft inner surface. Corpocinema 1967, Theo Botschuiver, Jeffrey Shaw, Sean Wellesley-Miller and Tjebbe van Tijen. The Corpocinema was an expanded cinema environment presented in a series of open-air performances in Rotterdam and Amsterdam in 1967. The work dematerialised the opaque flat projection surface of traditional cinema by creating instead a transparent three-dimensional volume within which the cinematic image could be reconstituted in an equivocal and immediate way. The specific physical and temporal qualities of the various actions and events performed to materialise the projected images also caused dramatic transformations and re-constructions of those images. The basic structure was a large air-inflated transparent PVC dome onto which film and slides were projected from the outside. These projections were made visible by physical events and performed actions that created temporary conditionsthat materialised the projected imagery within and on the surface of the dome. For example, white polythene tubing was inflated until it filled the interior of the dome, thus creating a complex, growing surface on which the image appeared - then the dome was deflated over this tubing. Fire-extinguishing foam was sprayed over the entire inner surface of the dome, building up an opaque white projection surface - and as the foam dripped off the dome, the projected image disintegrated. Various other substances such as smoke, steam, water spray and confetti were used to fill the interior space of the dome and so constitute a volume of particles on which the projected images were attenuated. Dots Obsession is physically and visually crowding out human visitors. “Kusama's interest in pattern began with hallucinations she experienced as a young girl–visions of nets, dots, and flowers that covered everything she saw. Gripped by the idea of 'obliterating the world,' she began covering surfaces with polka dots. 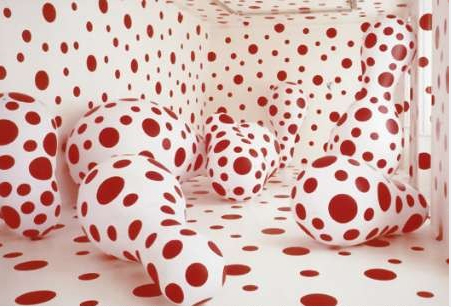 The vast fields of polka dots, or “infinity nets,” as she called them, were taken directly from her hallucinations. 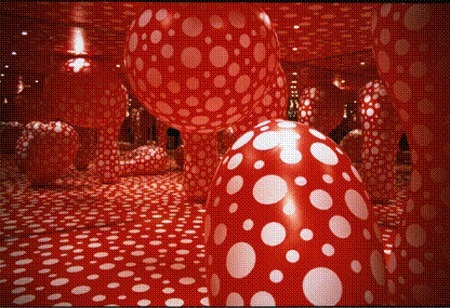 Yayoi Kusama said about her 1954 painting titled Flower (D.S.P.S), “One day I was looking at the red flower patterns of the tablecloth on a table, and when I looked up I saw the same pattern covering the ceiling, the windows and the walls, and finally all over the room, my body and the universe. I felt as if I had begun to self-obliterate, to revolve in the infinity of endless time and the absoluteness of space, and be reduced to nothingness. As I realized it was actually happening and not just in my imagination, I was frightened. I knew I had to run away lest I should be deprived of my life by the spell of the red flowers. I ran desperately up the stairs. The steps below me began to fall apart and I fell down the stairs straining my ankle.” Today she lives, by choice, in a mental hospital in Tokyo, where she has continued to produce work since the mid-1970s. Spectators can introduced their heads into a suspend inflated volume. Inside speech is autonomous, separated from the body. It separates the viewers head from their bodies and focuses their attention on their mind. The Inside Out Inflatable Room installation is an inflatable room made from rubber latex, which she constructed to explore the concepts of public/private and exterior/interior and to think about how the concept of a “room” is an extension of the human body. For this piece, she made a rubber latex mould (a skin) of one of the rooms in her old apartment and then created an external support structure during a six-week artist residency at La Chambre Blanche, in Québec City, in order to inflate the entire piece. Originally presented in a large gallery space, the sculpture creates a two-fold viewing situation for the visitor, who can look at the exterior structure of “the room within a room,” as well as enter the structure and experience the whimsical and unsettling space inside. 2e picture detail of the ceiling. The large inflated sphere is a relaxation chamber andthe space leading into it can be transformed via the inflation and deflation of the surrounding balloons. Ein Volumen aus Licht, Moninka Gora, Schottentor, Vienna, Austria, 1995. A 30 x 10 and 8,5 meter high ballon with sulfur microwave lamps; The strong lights resemble sunlight…In daytime, the presence of the volume was conspicuous bacause of it's obtrusive size and whiteness. When it got darker the perception of it became even more intens: an odd mixture of nature and culture, of dead and alive, of conscious and subconscious…Right picture A Drop of Light Stockholm, 1998; A balloon, 24 meters long and 12 meters high, filled with artificial sunlight in the winter darkness. Passing into a darkened entrance hall, you are ushered, not to say bundled, through a doorway into an immense, red womb-like space, lit through its membrane-like surface which looks soft, almost velvet-like, but is rubbery and barely yields to the touch. Gaping orifices open out into three more pod-like spaces. Far from standing in the exhibition hall looking at an object, you’re in the object itself, with no sense of the surrounding environment – until the sun comes out projecting the web-like patterns of the Grand Palais’s roof over the rounded surfaces. Moving through the arches formed by the immense rounded rubber feet you feel truly tiny, the people on the far side of the hall appearing positively antlike. Yet far from feeling oppressive, this immense mass glows where the light hits it, reflecting the leaping at nouveau arches overhead. Whichever way you look or move you’re hit by some extraordinary new vista. The juxtaposition of the two structures is exhilarating in its sheer unlikeliness: the Grand Palais, epitome of the self-consciously man-made, and Kapoor’s rubber mass, which for all its organic, bodily qualities is no less synthetic. While Kapoor has stated that the work’s title. 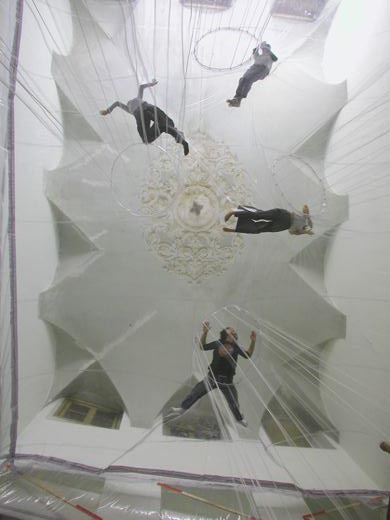 ‘Leviathan’, the piece is a play of structure and scale that alludes to the idea of the cathedral: the body as living, breathing sacred space, inside a structure that is literally cathedral-like.